I think I know something about Philip Guston. I think I know something about Philip Guston. I think I know something about Philip Guston. I think I know something about Philip Guston. These four statements together, I think, know something about what Philip Guston knew. What I really know of Guston is in the paintings themselves. Oil paint, for him, was the stuff of everyday life, like coffee and cigarettes, books and shoes. It was material that could hold and communicate feeling. He had a sense that the canvas was the place where the picture was actually happening , in the continuous present moment. He loved the Italian painters, particularly Piero della Francesca. 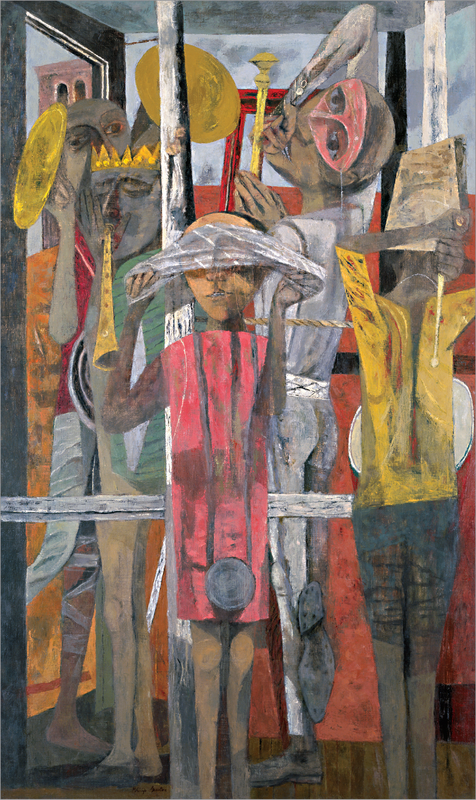 Guston was the composting soil to Piero’s immense daylight. His paintings began in darkness, the forms bound to gravity, time and struggle. The horizons loomed, not aspirational, but unreachable. Aronson remembered his friend as a “master of pain”. Pain was generative for him, a creative stimulant. Philip’s early years were marked by tragedy and dislocation. His Jewish parents fled persecution in the Ukraine, emigrating to Montreal where Philip was born in 1913. As a boy, his family moved to California to improve their circumstances but work was scarce and the social climate was worse. Ku Klux Klan intimidation and violence against blacks, Jews and other minorities was unrestrained. Philip’s older brother had lost both legs to a car accident and later died. His father was reduced to collecting and sorting refuse, a “junk man”. He hanged himself when Philip was 10 years old. 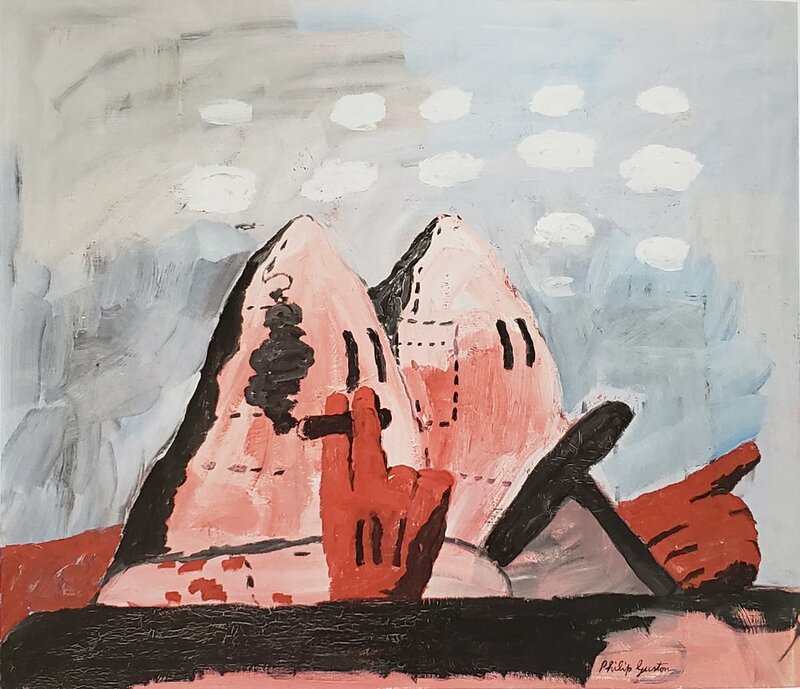 Guston would later reflect, “imagine what it was like when I found him there, like that.” These early griefs would continuously resurface in his paintings throughout his life..
His mother recognized his need for solitude and encouraged his love of drawing. At her son’s request she outfitted a closet with a desk and a single light bulb for him to work by. Philip was a gifted and unruly young man. He and his friend, Jackson Pollock, were expelled from high school for criticizing the administration in the school newspaper. Philip later managed one year at Otis Art Institute before abandoning formal studies altogether. It was the 1930’s and Guston was a working age man in the middle of the Great Depression. 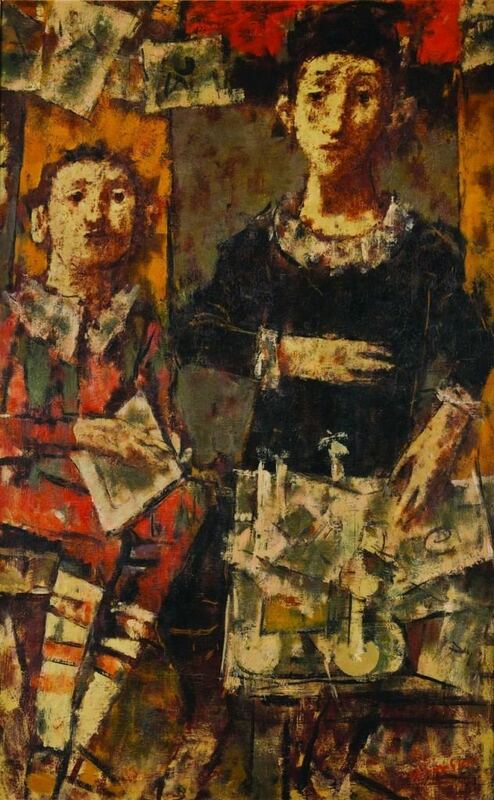 He traveled to Mexico to study with the great muralist and then to New York City where he met again (first time at Otis Art Academy) Musa McKim and they were married and had a daughter, also named Musa. Little Musa would later write Night Studio, a memoir about her father and their family. Guston was immensely talented and adaptable, absorbing multiple influences, and synthesizing emotional resonance with Italianate order. 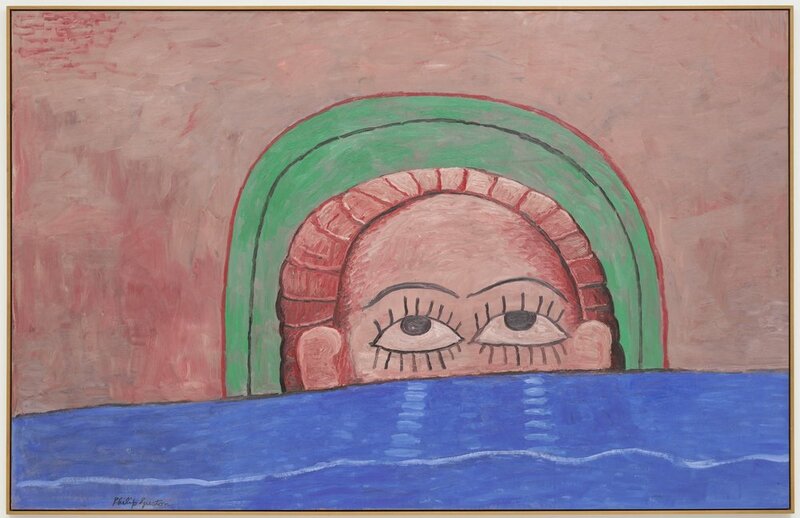 Philip Guston was always a painter of his times until in 1970, when he abruptly wasn’t. During the 50’s and 60’s, living in New York, he was deep in a circle of heavy hitters: his old friend Jackson Pollock, Willem DeKooning, Marc Rothko, Franz Kilne among others. In their studios and conversations at the Cedar Bar, they were, by layers, letting objective content fall away from their paintings. Pollock spoke of his own vigilance against narrative elements that would start to surface from his gestural paint drips. When some recognizable form would appear, he would strip it back to abstraction. Guston however was, in part, pretending, wearing another mask. He never fully embraced the abstract ethic. “American Abstract art is a lie, a sham, a cover-up for a poverty of the spirit. A mask to mask the fear of revealing oneself..." wrote Guston. "Where are the wooden floors- the light bulbs - the cigarette smoke?” Things continued to show themselves in his paintings. Heads would take shape in the half light, cobbled heels would drum pattern into the darkness. 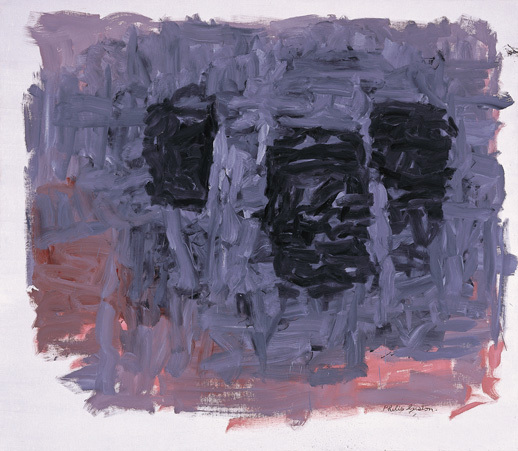 In 1970, Philip Guston had an exhibition at the Marlboro Gallery in New York. From the veiled ambiguity of the abstract, a full blown narrative world emerged. The paintings were populated with hooded Klansmen, clocks, cigarettes, cars, piles of junk, bodiless limbs. Bowls of cherries shared scale with pyramids. Boots landed on earth like visitations. Giant hands emerged from clouds. Guston was largely thought to have cracked, or to have pretended to crack. In the New York Times review, A Mandarin Pretending to be a Stumblebum, Hilton Kramer called foul, describing the “disengenuous” attempts at crude, childlike and primitive pictures, as a “pseudo-event.” Even his friends and colleagues thought he had mis-stepped, though many trusted his insight. Only Willem DeKooning saw these paintings as being “about freedom”. And it was a particular kind of freedom. He had uncovered a way of painting that was direct, material and included the recurring forms and symbols of his life, the anxieties and wounds, his appetites, his adoration of the Italian Masters, the work-a-day malevolence and humor of Herriman’s Krazy Kat comics (which Guston loved), his beautiful wife Musa. 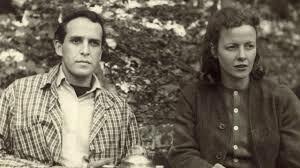 He wanted to move toward Piero’s expansive and generous order but Guston was a bottom dweller and his path had to include the worst and most neglectful within us. My favorite painting of Guston’s is The Studio, of 1969. It is Guston’s offering that even in solitude, we hide from ourselves. The hooded Klansman, the cowardly and malevolent maker of “others”, has been internalized as the artist himself. It is the beginning of honesty and the painting is full of daylight. Piero’s faultless blue is just out the window. Philip Guston died in 1980 at only 66 years of age. I would have loved for him to have 20 more years of trying and bring the grime and the grace together. 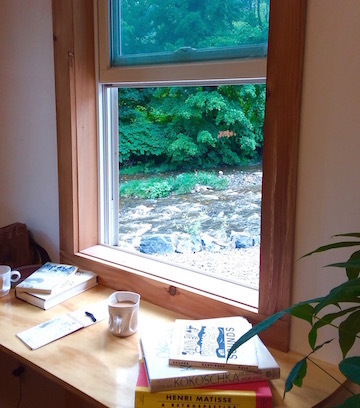 Thank you for reading and for supporting The Drawing Studio.